So you’ve been handed this box full of puzzle pieces and you been tasked with putting it back together. There might be a few people that hope that you fail, but they have a personal agenda, and I am not one of them. I hope that you make the cover of Time magazine – twice. I am going to be the next – but not the last – in a long line of super-duper experts on the topic who will offer some insights into the challenge that you have accepted. I am going to assume – because I do not know – that your goal is to make the IndyCar Series a professional sports property that is supported by a “large audience”. And “supported” means in-person, and through media (TV, radio, www etc). So measurement, for the purposes of this exercise is “large audience” – period. It’s not the coolest cars, longest straightaways, highest speed, greatest dancer, biggest tires, sexiest driver…. It’s “large audience”. I choose “large audience” for a couple of reasons. First, nothing that you are doing matters if nobody cares. It’s not about close finishes – USAC Midgets and go-karts have some of the best “racing” you’ll ever see. But nobody (except Robin Miller) cares. You need audience. And second, and this is key: Audience = Value. Over the past 15 years, I have had literally hundreds of racers, team managers and team owners say to me “I need a sponsor”… and my response for the past 15 years has always been the same. “No you don’t need sponsors… you need value. Find value and the sponsors will come….” Approximately – give or take – 100% of those people walked away shaking their head and mumbling that I didn’t know what the hell I was talking about. 1) The audience needs to be able to relate to the talent of the athletes. 2) There has to be something significant on the line. In other words, the ‘prize’ for winning has to be substantial. 3) You need to have the very best competing at your events. That’s it. Don’t believe me? Just remove, reduce or diminish any one of the three and see what you have. When you have these three things in place, everything else follows. Everything. Audience, sponsors, TV, merchandise sales, the best team owners, the best athletes, the best crews, the best talent… everything. So, that’s the problem Randy. The IndyCar success triangle has some short, weak, flimsy sides. Okay… still skeptical. Let me prove it. And we’ll do each ‘ingredient’ – one at a time. I am going to give you examples of properties where this is missing, relatively speaking, and I’ll give you examples of properties where this exists. Let’s start with the Big 4 mainstream sports properties in North America. 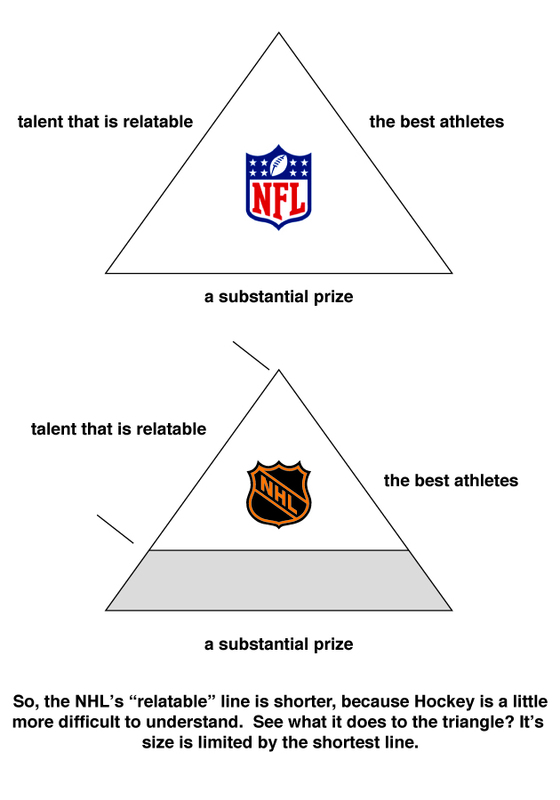 The NFL, NBA, MLB and NHL. Remember, the audience needs to be able to relate to the talent of the athletes. Which of these sports has the ‘largest audience’? That would be the NFL. Which has the smallest? The NHL right? From the mind of the audience, which sport is easier to understand, and why? Here’s the NFL; two 350 pound guys, who can run really fast, smash into each other. It’s like the Flintstones meets NASCAR. The audience can see this and understand what is happening. A wide receiver completely stretched out to catch a pass with one hand is easy to appreciate – even if you have never seen football before in your life. This is really important. In the NHL, the audience is able to understand the athletes ‘better’ if they’ve played hockey themselves. If you take the same person and expose them to football and hockey, they will grasp football first. This is how you grow audience. By having the ability to relate to the talent of your athletes. And no matter what the NHL does to try to explain ‘offside’, they will always be limited by this. In your sport Randy, the challenge is that unless you’ve driven a race car, it is hard to “see” Will Power’s talent and relate to it. To the masses – the general public – Will looks the same as Danica going through any given corner. But there is clearly a difference in talent that is hard to appreciate. In fact, speaking of talent, what is Danica’s talent compared to Sebastien Bourdais? Both are clearly extremely talented, but they are talented at two completely different things. Which ‘talent’ will drive your growth? To have mass appeal, you need the best athletes, and the masses have to be able to relate to their talent. This is a big challenge, and that is putting it lightly. Cricket is an incredible, global, professional sport, but I don’t follow it. I can’t relate to the talent of the athletes. I just don’t get it. Randy, this ingredient is key because the audience wants to know that there is something on the line. A monumental prize for the winner, and significant lost opportunity for the loser. The audience needs jubilation driven not just by financial gain, but by the prestige of winning, and they need heartache and disappointment. They need to see success and failure at the highest level. This is why your Indy 500 means more than the Iowa race – whatever it is called. And this is why the 6:00pm news is so popular. People think that “Reality TV” is relatively new. They are misguided. “Reality” programming such as the newspaper or TV news broadcasts have always been around. Reality TV was borne from the audiences’ desire to see winners and losers, pain, sorrow and occasionally – joy. When the audience’s appetite wasn’t fulfilled from 6:00pm-7:00pm, the networks created their own misery – Reality TV. Ted Turner, of course, recognized this many years ago and created CNN. Back to my point Randy; The Stanley Cup, the Super Bowl, an Olympic Gold Medal, the World Series, The Indy 500, the Daytona 500, the Monaco Grand Prix, the Kentucky Derby, the Masters, the 24 Hours of Le Mans. These ‘prizes’ transcend these sports. Audiences that have no interest in the ‘sport’ come from far and wide to experience these events. Why? Because there is a significant prize on the line. If the prize for winning American Idol was a three-night gig at the Holiday Inn in Brownsburg, Indiana, who would watch? Take the same talent – talent that the audience can relate to – and change the prize. Simple. Motorcycle racing in the US is a great example of what happens when you take away the prize. It’s dead. The Daytona 200 used to mean something. They took away the prize and they excluded the best athletes…. and you can stick a fork in motorcycle road racing. But I digress. Okay Randy, this one is real ball-buster. I say that because as long as there has been motorized competition, there have been “fast guys, rich guys and idiots” (thanks Sam Moses). But nonetheless, as I have stated above, and as history has proven, if you do not have the very best in your ‘competition’, you will fail – always. How many players in the NFL ‘bought’ their roster spot. Randy, I know you have heard this analogy many times before, but if Mark Cuban had bought the Dallas Mavericks and inserted himself into the line-up, the audience would disappear. Not at first, because remember, we love failure, pain and misery, and we need to be able to relate to the athletes. But in this case, it is not sustainable. You want more proof? Look at the Grand Am Rolex Series. What a can of worms they are in. Without their ‘gentlemen racers’, they would not exist. You should thank your lucky stars that you have not been charged with growing their audience. Ride-buyers and other ‘drivers’ who have no business being on the track, while the real talent sits on the sidelines, won’t work. Here is the other problem with this, and this is also very critical. As soon as a driver, or a team owner, reaches into their pocket to participate in your series – you work for them. Period. Do you want to work for Chip? Or do you want to work for your audience? Which ‘boss’ offers long-term stability? When your property has not provided enough ‘audience’ to build a profitable value proposition, you’re in trouble. I don’t care that “it’s always been like this”. What I care about is that it won’t work. So, if your going to head down the path of allowing ride-buyers, you need to change your positioning. You’re not a professional sport. You’re a platform that allows talent-less people to “live their dream”. You’ll need some branding/marketing agency to help with the positioning on that. Maybe Gene Simmons of KISS. Does your audience understand why Milka is racing and Bourdais is not? So there you have it. I am fully aware that I have not offered any real solutions here. But, until somebody points out what the problem really is, anything you do is either short-term or irrelevant. If a new car is the answer, then you need a new car – all the time. If splitting one race into two is the answer…. cool, but that is change for change’s sake, and you need your next 10 changes lined up and ready to go. So, my letter to you Randy is to tell you what the problem is. There are great lessons to be learned all around us. Like American Idol. I love American Idol because of the beauty and simplicity of the show as a marketing communications platform. What is the difference between Carrie Underwood before and after appearing on American Idol? It’s not talent – she had that. Sure they massaged it, but she had talent. She’s one of the world’s best. The only difference between Carrie before and after is…. audience. That’s the only difference. But this isn’t just any ordinary audience. American Idol’s audience is 30 million strong – the world’s largest focus group. Every week they tune in and answer the question that American Idol is really asking. That question is, of course, “Which one of these 80,000 contestants’ album who you buy?” Again…. so simple. Every week, the focus group answers that question and when the record comes out, they already have…. audience. The producers of American Idol aren’t in the TV business – they’re in the music business. And Ford and AT&T fund their search for new talent. Think about that and explain how a new car can do this for you. And think about your focus group Randy. Who are they? Where are they? What do they want? So that’s it. You need the best athletes in the world. They need to be relatable and you need to have the big prize. Do this and history has proven that you’ll have audience. And audience Randy… equals value. Move fast Randy… be careful who you listen to… and good luck. I am pulling for you. I really am. This entry was posted in Rants! and tagged "Indy Car". "Randy Bernard". IZOD, "sports marketing", automotive. motorsports, car, Indy, IndyCar, marketing, race, racer, racing, sponsorship by Brandrenaline, Inc.. Bookmark the permalink.